MINOT, N.D. – NOTSTOCK continues to color the campus in creativity and collaboration. In its 12th year, Minot State University’s annual live signature arts festival includes artists from across the United States who share their work and talents with the community. Whether its poetry, theatre, drawing, pottery, digital art, film, or printmaking, come participate in the arts Oct. 4-6 on the Minot State University campus. Artists Ben Chlapek of Chicago and Dave Kloc of Los Angeles are illustrators and printers who make posters for bands, comedians, movies and TV shows, collectors, and more. Their artwork will be on display in the Northwest Arts Center Gallery in the lower level of the Gordon B. Olson Library Oct. 4-12. Join them at the artists’ reception Thursday, Oct. 4 from 6-7 p.m. in the gallery. Also see them print live in the Student Center Beaver Dam Oct. 4-6. They will speak about their work at noon on Oct. 4 and 5 in Aleshire Theater, and their posters and prints will be available for purchase at the event. Robin Reynolds, North Dakota potter and owner of Dakotah Clayworks, is this year’s PotStock guest artist. She brings a long history of helping others learn about art. She and Minot State faculty and students will give ceramics demonstrations in the atrium of the Student Center. Reynolds will give a presentation of her work Oct. 4 at 10 a.m. in Aleshire Theater. Also, stop by and visit with Reynolds and learn to hand-build or throw on a potter’s wheel all three days of the event. WordStock welcomes Anders Carlson-Wee from Minneapolis. Carlson-Wee is a nationally touring poet, performer, and teaching artist. He is the author of The Low Passions (W.W. Norton, 2019). His debut chapbook, Dynamite, won the Frost Place Chapbook Prize. He is also co-director of the award-winning Riding the Highline, a poetry film about a train-hopping trip he took with his brother, Kai, who is also a poet. The film will be screened during this presentation Oct. 4 at 7:30 p.m. in Northwest Arts Center Gallery. Carlson-Wee will conduct workshops with students, and he will also host the Oct. 5 Poetry Slam in the Beaver Dam at 1 p.m. Bring a poem to share. Prizes will be awarded for best poetry slam performance. Take the stage with Minot State alum Chris Stroschein. He will keep you laughing and learning as he shares theater and improv tools and techniques at 10 a.m. on Oct. 4 and 5 in the Black Box Theater. Similarly, NDstrong will put students in the spotlight during one-hour filmmaking workshops at 9 a.m. on Oct 4 and 5 in Minot State’s Broadcasting area. “NOTSTOCK is a hands-in, hands-on participatory arts event where learning and connections are discovered through experience, serendipity, and environment,” said Bill Harbort, professor of art and NOTSTOCK co-organizer. Kal Asmundson: Autobiography, a traveling exhibit on loan from the North Dakota Museum of Art, draws directly from a painful dark family history. Asmundson, of Winnipeg, Manitoba, created 17 powerful pieces of work for this exhibition. Each one contains a text scrawled across the face of the image, or enclosed in the text box below. In reading the text and viewing the images, one is reminded of the numerous children who experience the daunting days Asmundson faced. The exhibit is free and open to the public on the third floor of the Student Center Conference Center Oct. 4-5, 9 a.m. to 4 p.m., and Oct. 6, 10 a.m. to 3 p.m.
Don’t forget to make a souvenir to take home. 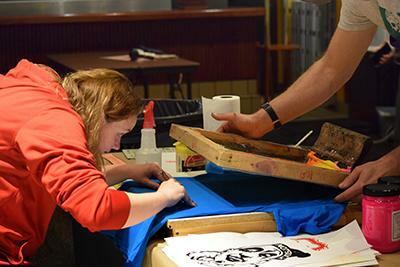 Do-it-yourself screen printing continues in the Beaver Dam Oct. 4-5 from 9 a.m. to 5 p.m. and Oct. 6 from 10 a.m. to 3 p.m. Bring a T-shirt, hoodie, tote bag, any other item for printing, or buy a T-shirt at the event and personalize it with a NOTSTOCK design. While there, compete in hilarious tongue twister contests each day. Local musicians will play at various times throughout the event. “Saturday (Oct. 6) is community day at NOTSTOCK. The place buzzes with kids and adults making art and listening to music. It is the perfect way to spend part of a Saturday with friends and family,” Geller said. NOTSTOCK closes with a reception at 62 Doors Gallery & Studios Oct. 6 at 7 p.m. Wild Hands and Friends will provide music. A special exhibit of the artwork of NOTSTOCK guest artists, Chlapek and Kloc, will be on display. Come enjoy art, food, music, and good company with this year’s guest artists. For a complete list of times and events, visit msunotstock.blogspot.com. All NOTSTOCK events and performances are free and open to the public.